In parts I and II of Business of Editing: What to Charge, we discussed the effective hourly rate (EHR), how to calculate a true EHR, why it is important to have a definition of what constitutes a manuscript page, and why I think it is smarter to charge by the page or project rather than by the hour. But knowing your required EHR is not enough; you need to track it as well. I use two programs to track my EHR: Timeless Time & Expense (TT&E) and Microsoft Excel. In the case of TT&E, I am using an older version because it does all that I need. TT&E is not freeware and it is a bit pricey if all you want is to track time, but I like that it makes it easy to track multiple projects. In any event, what you need is a good timing program that will track how much time you spend on a project and give you a total time. Excel is a program that most of you are familiar with. However, as with TT&E, it is not necessary to use Excel; any quality spreadsheet program will do. Tracking time is key. I round total time up to the nearest quarter hour. For example, if the total time I spent on a project is 25 hours and 1 minute (25:01), I enter that as 25.25 hours. I know that somewhere along the line I missed timing a few minutes of work, so this is a way to compensate. Another thing I do is track the time based on billing cycles. If a project is to be billed only upon completion, then I track the time until the project is complete and being billed and use the single total time. If the project is being billed in batches, then I track the time for each batch and enter the time in Excel batch by batch. As you can see from the following image, I use a simple form to track important data. What is important is that even at the lowest per-page price of $2 per page, the EHR exceeded the required EHR of $25 (based on editing 16 pages an hour; at a rate of 13 pages per hour, the EHR would still be exceeded but at 12 pages an hour, it would not be met. However, at $2.50 per page, where the illustration has a 19 pages-edited-per-hour rate, even at a rate of 12 pages per hour the EHR would be exceeded). This illustrates that it is possible to have a low rate and still meet and exceed the required EHR if you are efficient and productive. Do not, however, take this as an argument for a low per-page rate, nor an indication that you will always exceed the required EHR, nor an indication that one can always edit at such a high pages-per-hour rate — this is just an illustration of how to calculate and track the EHR. If the per-page rate had been $2 for the whole project, the EHR would have been $38.45 based on the numbers. 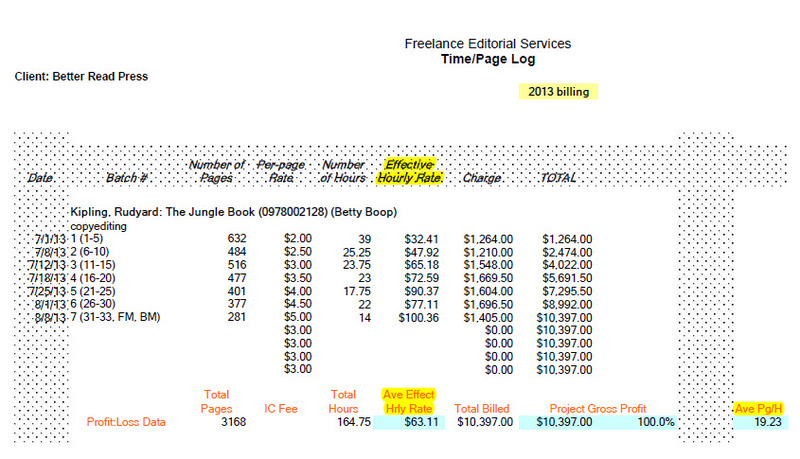 However, to achieve that EHR, the editor would have had to average, as indicated in the image, 19.23 pages an hour. Depending on the project and the parameters of the project, that may be doable. But we stray off course. The key to determining what to charge is determining your required EHR. But to determine that EHR, you have to have accumulated data. In the beginning, you guess, but as data accumulates, you can be more precise in your calculation. The important data are the EHR for each batch of submitted manuscript, as well as for the entire project, and your average number of pages edited per hour (shown in the image at the bottom far right). Unfortunately, the image doesn’t show the column labels. Column A is the Date; B is Batch #; C is Number of Pages; D is Per-page Rate; E is Number of Hours; F is EHR; G is Charge; H is Total; and K is the Average Pages/Hour. You need the column information for the following Excel formulas to make sense. Although the information is important, columns A and B are not needed to calculate any of the other data in the table. where, for example, E11 represents the data in column E row 11. The “” is an instruction to leave the cell in column F blank if the data in E11 equals 0.
which means to add the new Charge found in this row (G12) to the Total in the row immediately above (H11) so that the Total in this row is a running total. Remember that the numbers (e.g., 12 in G12) represent the row number; the letter represents the column. All of the data is row-centric; that is, the calculations are for the row only. The exception is the Total column, which is a running total. Although not shown in the illustration, you can also track your EHR over the course of time by adding up the total hours from each project and the total billed for each project and dividing the grand total billed by the grand total hours. With this data at hand, you can determine whether you are charging enough for your services. Adjustments can be made as needed. This information will tell you the state of health of your business. If you see that you are not making your required EHR, you need to analyze why not. Are there things that you can do to improve your efficiency and productivity? Or is the only solution to raise your prices and find new clients? Part IV adds some clarification and Part V concludes the series, tackling the question: Why bother? I’ve been wondering whether anyone else tracks and totals their business and living expenses, and looks at those numbers vs. income numbers to see how they’re doing at that level. I do this in my head as I go along, but I’m as guilty as many others probably are of only really looking at the comparison when it’s time to do tax paperwork. If my bills are paid and I have money left over in my checking account each month, I feel as if I’m earning “enough,” but that isn’t a very business-like way of doing things. I track my time with a timer program and enter it into a spreadsheet as Rich does. I track per chapter, section, batch, etc., to see the trend in my time during a particular project, but it’s the overall time per an entire project, client, and year that goes into bigger decision making about pricing and marketing. My strategy to make sure I’m bringing in my goal income is to increase my efficiency and productivity as well as to focus on clients who pay well and see my services as value added to their projects rather than those who see my compensation an annoying expense that should be minimized as much as possible. OK, the latter type of client is an extreme, but I have worked with such clients, and no amount of efficiency on my part has made their projects worthwhile to me. For the former type of clients, I work as efficiently as I can, while delivering high-quality work. That’s the winning combination for me.